Another action-packed month at Muckrach Country House Hotel, filled with renovation work, interior design and familiarisation trips to activity providers. The building team are roofing the conservatory; removing glass and replacing with slate. The hope is that the Coffee Shop / Restaurant can be more successfully temperature-controlled, with the help of the air-conditioning/heating unit, so you can dine in the warmth in winter and be cooler in the summer. The extension has begun, which fills in the recess on the back of the building, creating an additional bedroom with en-suite and the kitchen downstairs. It’s wonderful to see our luxury hotel taking on its fantastic new shape! The tiler has started to tile 4 of the 11 en-suites, which is really exciting, as we get a glimpse of the luxury en-suites for the bedrooms. 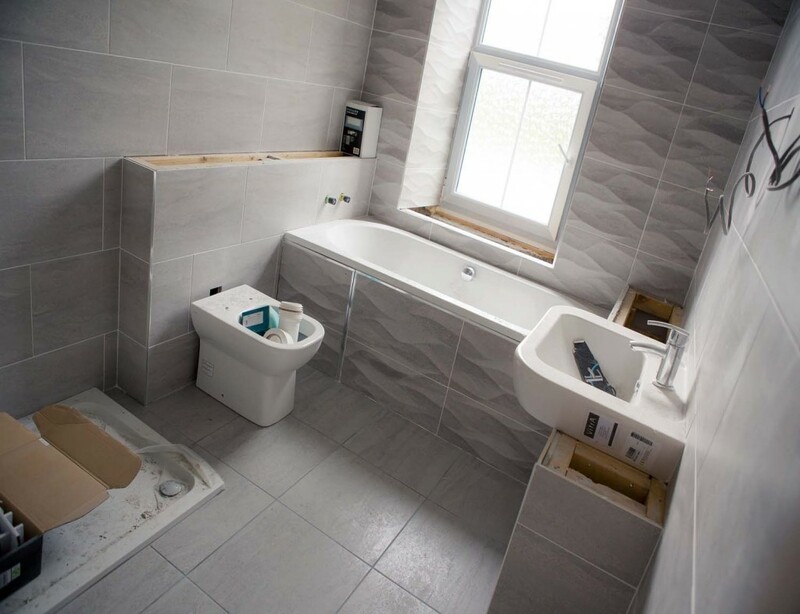 Each bathroom will offer either a shower or bath or both with white suite, chrome fittings and porcelain tiles from floor to ceiling. 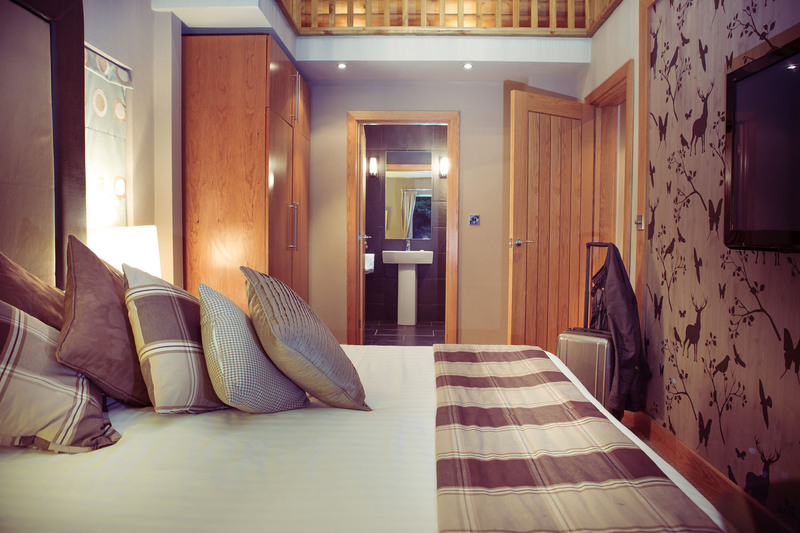 Under-floor heating and fluffy towels will ensure you feel cosy and comfortable throughout your stay. Pipework and under-floor heating systems are currently being installed by the plumber throughout the ground floor of the Victorian Shooting Lodge. No matter the weather in the Highlands of Scotland, you should feel warm and cosy. As you watch the snow fall outside, the fires will be roaring, the floors will be warm and the insulated granite walls will keep the warmth inside. The interiors team are reviewing and sourcing all the materials, wallpapers, chairs, tables, furniture, mirrors, pictures and much more. Planning the room layouts; where chairs and tables should be placed, whether there should be carpet or wooden floor and the curtain material to hang at the windows. 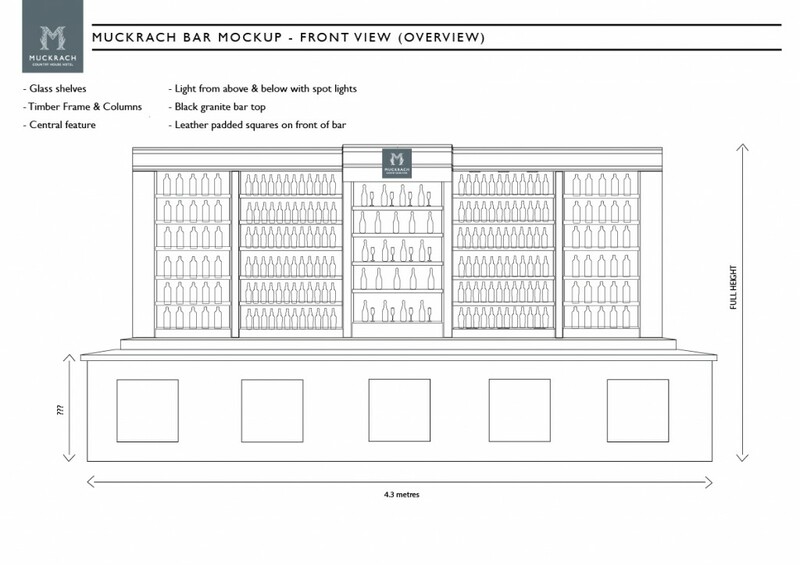 The bar has been designed in-house and is being created by Highland Joinery and Glazing is creating a grand feature across one wall, cedar, glass and granite will hold whiskies, gins and local beers, amongst many other tipples. The landscaping of the grounds is also in discussion; to create a sweeping drive with grassed lawns and mature trees. An ideal setting for hot tubs, you can imagine yourself sipping champagne whilst gazing at the stars in the skies unaffected by light pollution. The pond at the front of the hotel attracts heron, ducks and other wildlife and will remain a key feature in the landscaping. The driveway will be finished with tarmac and sweep past the trees and stream from the main road. This is essential maintenance work, especially with some of the classic cars that have already visited us, and those that will return again. We had a photography shoot with Bygone Drives at Muckrach, who brought 3 classic cars to park outside Muckrach as a duel promotion. 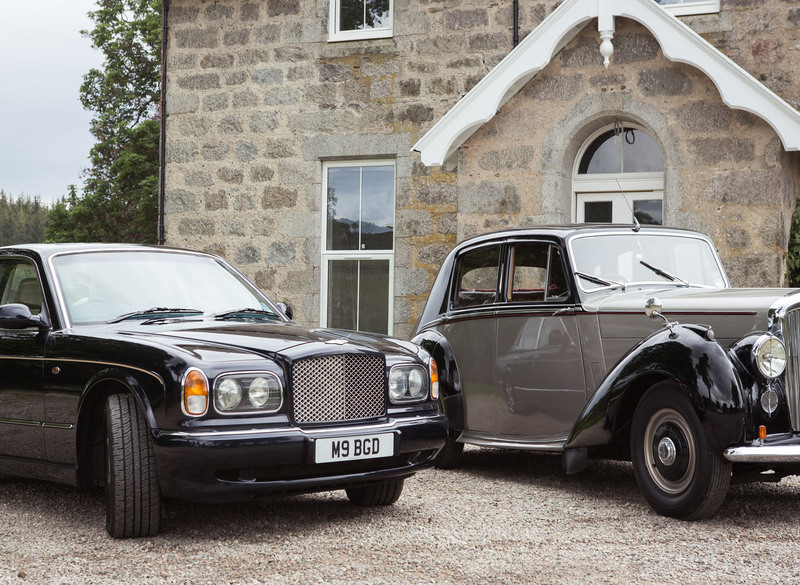 Bygone Drives can supply classic and prestige cars to hire for a special occasion or chauffeur driven cars to take you to an event or on the malt whisky trail; choose from a Rolls Royce, a Bentley, a Jaguar and a Range Rover to name only a few. 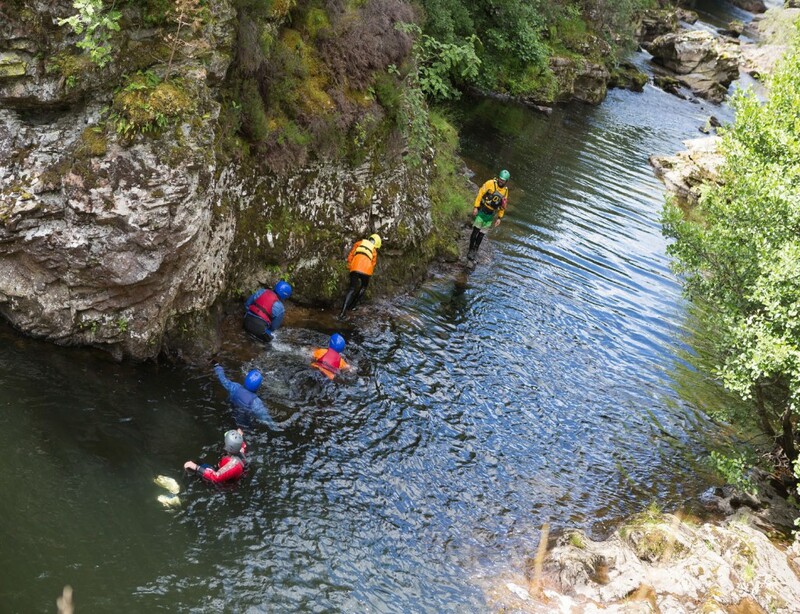 To check out more of the action in the Cairngorm National Park, another part of the team went to Aviemore and nearby Rothiemurchus to zip wire in a canyon, river tube along the River Spey, bike trail along Loch an Eilein and capture the golf at Boat of Garten Golf course. With thanks to G2 Outdoor, an amazing outdoor activity company, for the awesome zip wire experience (GoPro footage will be available soon). Full on Adventure again gave us an amazing chance to river tube along the River Spey, in addition to the gorge walking that we had photographed in the morning; adventure definitely by name and nature! Pony trekking or Archery, with the backdrop of the Cairngorm mountain, were also photographed at Rothiemurchus. For those of us who seek less adrenalin driven activities and enjoy wildlife; the exciting news from Loch Garten RSPB, (an RSPB centre only minutes away from Muckrach) is that the 100th and the 101st osprey have fledged from the nest. Every year the osprey return to the same nest at Loch Garten to breed; visit the hide or watch the webcam to observe the osprey parents and their chicks’ progress. The list of reasons to visit the Cairngorms and Muckrach Country House Hotel, just keep on growing! Our boutique hotel in the Scottish Highlands should be open by Spring 2015, a date revised to give us a little more time to create the luxury hotel that is perfect for your getaways.